It’s November already, which means it is time for Open 5s! Following the last of the summer’s antics, I spent 4 weeks feeling endlessly tired. Then ‘ping!’, like a switch had been flicked, two weeks before this race my energy came back. I felt all bouncy, even if my running legs had taken a short sabbatical. So I was looking forward to the start of the Open 5 winter series. Lucy had warned me of various potential impediments to our performance, the most serious of which was a sore wrist. Any little niggles I had paled into insignificance next to how I felt at the first race last year (injured). So we planned to bike first, with lots of options to bail out early if it was too bumpy and Lucy couldn’t hold on any more! We were both happy to try and run as far as we needed to. It was a scramble to get ready on time as James had ‘put the clocks forward’ half an hour and we only had until 10am to faff! It had already started raining before we set off. So we donned our waterproofs and started almost, but not quite, last. First challenge: writing control values onto wet maps. I tested out the free all-weather pen I got at Ötillö and it did the job! We did have to adjust all our routes though, because the controls we had planned to miss were high scoring 🙂 . Straight up a hill and I was very hot, glad I hadn’t put on a warmer jersey. About an hour later on top of a wild and windswept hill, I really wished I had. We were soaked and the rain was pelting into our faces, stinging our skin as we squinted ahead. At the very top of a hill we had to search for a control ‘on a rock’ … We must have examined 20 rocks and gone back and forth a few times with two other racers without finding it. Just as we were about to fish out the phone for a photograph to prove we’d been there, the little flutter of red and white tape caught my eye. Got it! Time to descend… slowly for Lucy’s wrist. Slowly for me it turned out too, as my front brake decided to fail. Later it came back, just as my rear brake got all sticky. Trip to the bike shop in order. We got colder and colder as we descended to a raging stream and old mining buildings for another control. Eating had seemed too much of a hassle with wet gloves in the cold, but we both paused to get something before turning to ride back up the hill and wait for some warmth to return. Soon we were off the hill and could hear our voices above the wind again. This was important as we hadn’t seen each other for 6 months and had some serious chat to catch up on. Lucy kept telling me we had definitely ridden up this road or track together before – apparently in the first race we ever did together! But it all looked new to me 😀 . We completed the second circle on our figure of eight route, picking up all the higher scoring bike controls and coming into transition after 3h:20. This was actually longer than we’d normally plan for. Luckily Lucy’s wrist had held up well enough and we were happy with our route choice. We also found the benefit of having multiple watches and knowing the ‘real time’ we had set off. One of them had claimed we had gone into a time warp and had given us several extra minutes! We joined up with Lucy’s friend Angus, who just wanted some chat as we hauled ourselves up a near-vertical hillside. No problems providing that! I took the opportunity of the slower pace to wolf down a chia charge flapjack – always taste good. Every time I put my hands down for support, I hit a prickly baby thistle. My calves and back were burning. But then we were up, on a rocky technical path. Lucy flew ahead whilst I did my best to minimise the size of the gap. Down to a spectacular waterfall (TAKE CARE warned the control descriptions, and we certainly did), then turning to cross the hill we had previously biked over. Ideally, the return route on the other side of the river was the one to take, with higher control values, but it was also longer and we didn’t have time. We battled a headwind before cresting the hill and flying down the other side. My big toe (which I hurt in my last race) started complaining again, but by now it didn’t matter. We could see the finish down below us and just had to zigzag down and do a couple of wiggles and we’d be there. I was up for a sprint finish, but remarkably we didn’t need one. I slowed back down and we cruised in more than 2 minutes early! We must have been feeling off colour 😉 . Lucy’s new yellow van was right by us, so we got the boot up and hid from the rain whilst we rapidly changed. One of the advantages of running second in bad weather is that you can finish all nicely warmed up. 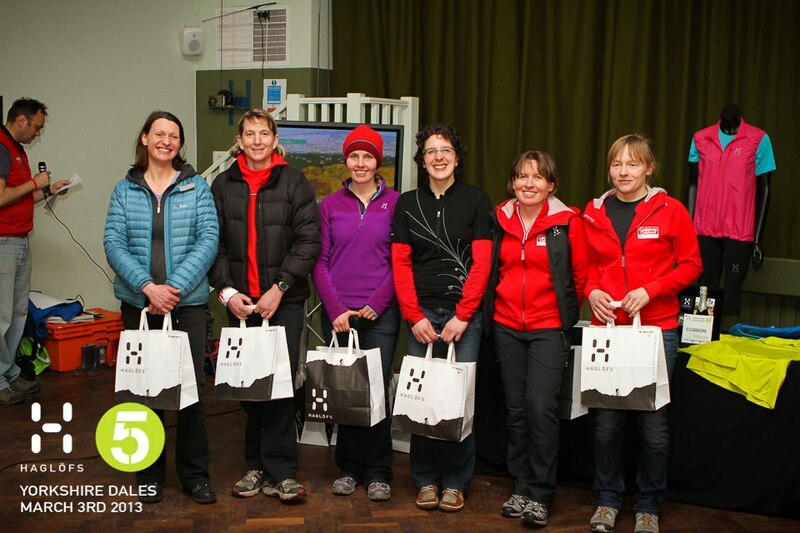 Before long it was back to the hall for a cup of tea, some veggie chilli and prize giving. We were delighted to have won. We had a fairly low score, but so did most other people too. It felt like we had ridden within ourselves on the bike, but we could definitely feel our legs on the run, so perhaps that wasn’t a bad thing. I thoroughly enjoyed myself getting out in the wild and catching up with Lucy. Looking forward to the rest of the series. 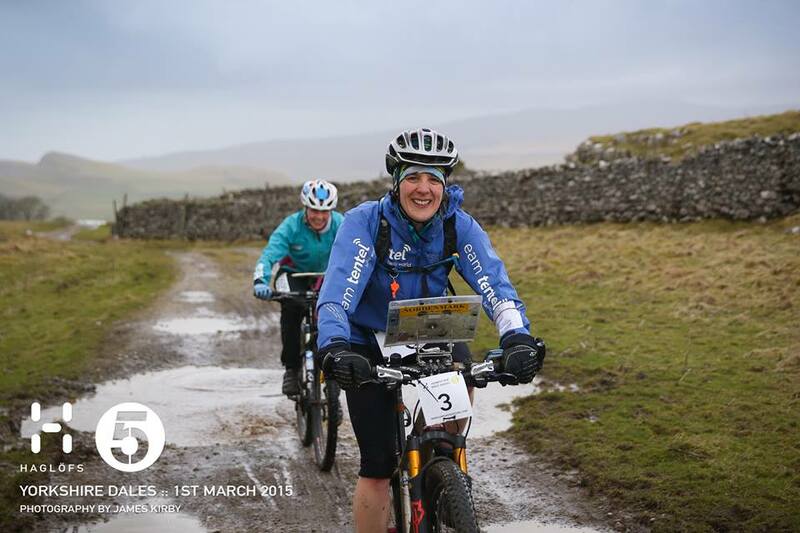 Many thanks to the organisers, Open Adventure, all the marshals, Nav4 for the food and Mandy for giving me a lift and braving the insane weather conditions on the way home 🙂 . 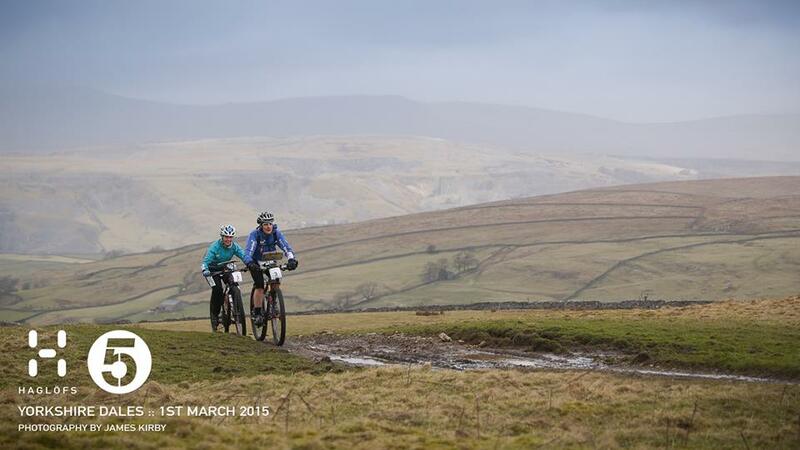 I am still slightly bemused about how well this race in the Yorkshire Dales turned out for us. In the days and hours before the start, I was getting messages from teammate Lucy such as: ‘I think I might be able to do 5 hours’, ‘this is damage control’, ‘I’m totally broken’ and ‘I wouldn’t have made it here if it was just me’. Yikes. I wasn’t feeling 100% tip-top myself, having had a funny tummy for a few days, feeling lethargic and carrying around a hip that was still grumbling from last week’s round of fun. However, I did feel fit and was able to muster up enough enthusiasm for two of us! The weather forecast was due to be wet and cold, getting worse as the day went on. Normally, we’d run first, but this would mean getting hot and sweaty and wet in the rain (I can’t run these speeds / distances in a waterproof! ), only to get on a bike and freeze. It’s much harder to generate enough heat to stay warm when you’re cycling. For this reason, we switched round and biked first. As it was, we got dry weather until just before the run started but then it got pretty bad – perfect! At the start lots of people couldn’t decide what to wear, Lucy included. In the end we both played it safe – I wore a coat for the bike and she had on full waterproofs, top and bottom! It was a good move though. I was under no illusions about what was required today: conservative, steady and, apparently, fun! We both stayed warm all race, which psychologically and physically was what we needed. We had drawn up a proposed route for the bike, and after we got the control values decided to tweak it only slightly and to go round in the opposite direction, collecting more higher value controls on the bigger hill first. There was more road riding than we sometimes face, but when we did go off road there were some high quality bridleways. Limestone all the way! We were particularly pleased with ourselves as we blasted down a long bumpy hill, passing people walking up and knowing we had gained most of our height on a road. Lucy was right that she didn’t have her usual zip up the hills, but we were moving much better than last time. We didn’t even resort to using the tow. I thought it was better to conserve some energy for the run so long as we were moving smoothly. I nipped ahead at gates to hold them open and let Lucy get a head start if I needed any map checks! We were also fortunate this month that our route looped back close to the transition area and had loads of shortcuts if we needed them. We didn’t, but the knowledge was reassuring. The instructions I was given at the start could not have been clearer: “Rosemary, you’re taking us on a 3h loop, and nothing more. NO ‘let’s just go …’ allowed!”. Consequently, as we neared the end of our loop and had the option of a 3km (total) out and back for 15 points, we let it go and carried on round. Just under 4km from transition, Lucy cried out that her rear tyre felt bouncy. Whaaat?! 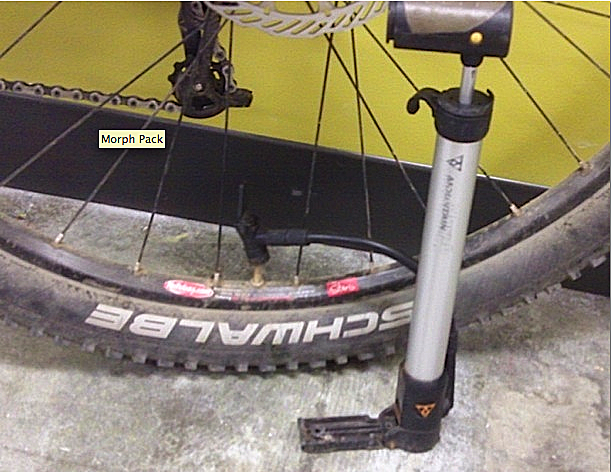 A puncture! Darn. We whipped out the pump and blasted some air in, hoping it would only go down again slowly. Lucy set off, I got my kit back in the bag and chased after her. Halfway back, I could see it getting squidgy again and the extra drag was having a detrimental effect on the little rises we still faced. We really didn’t want to stop again, so I gave a push up the last hill and we gingerly slid into transition. Phew! Oh, please can’t we go this way? Somehow, even despite this minor mishap, I achieved the impossible and got us back a ‘little bit earlier than expected’, a turn of phrase which does not normally enter my vocabulary. 2h50, plus 5 minutes to transition. Time to hit the run. We adjusted our plans due to the control values, then set off cheerfully. As we dibbed out, we told the chap who had gone out of the wrong funnel to watch us professionals to see how it’s done. Then we promptly went the wrong way, much to the amusement of the marshals. We like to entertain! We left one optional out and back only worth 10 points, but went for the other. 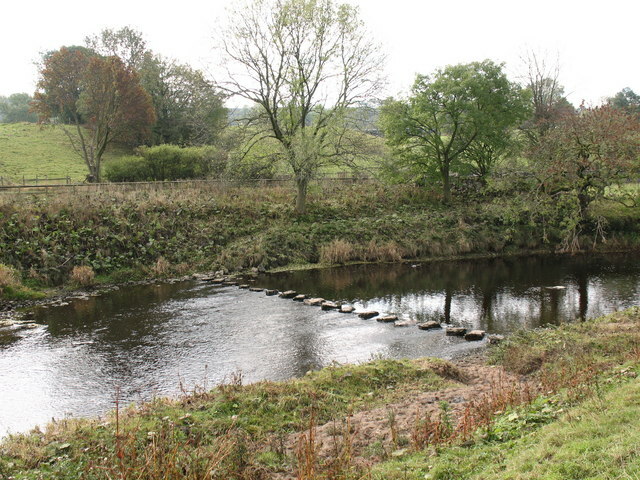 Lucy vetoed crossing the cool looking stepping stones; probably wise! Heading up the first hill, we were walking, which is most unusual. I felt a bit anxious that we’d need to move faster than this, but Lucy’s heart rate wouldn’t rise and there wasn’t much we could do about it except chat and keep cheerful. There were a few interesting controls on the run. The first was at the base of an amazing waterfall, that you couldn’t see until you were right there. I admired the view whilst stopped for the longest wee EVER, while Lucy started back up the hill. Soon we were at the top, running along a short stretch of road as it started snowing! This was fun. Slight mistake going into the next control, but nothing serious and we were heading into a cave. I half expected to see James the photographer here, but he had already been and gone. Lucy can always fly down the hills, and the reward for all that up was that we were now going down. We cruised alongside a railway to another unusual control location – inside an enormous kiln. I wish we’d had time to explore and read the info board! As we padded along next to the river I sensed that Lucy was tiring a bit. The solution was jelly babies and getting the tow out for the last hill. The second unheard of event of the day, as we hooked up the ‘wrong way round’. This is a strange sensation for me. The little tugs I could feel on the tow were hardly noticeable, but my legs were telling me that they were indeed working harder. 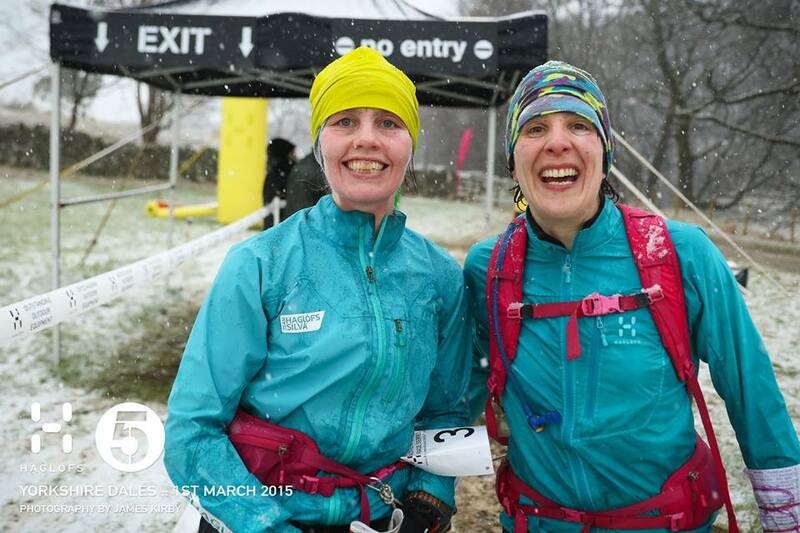 Now it was really snowing, we knew we had nearly finished and spirits were high. Earlier on, some people had remarked on our level of chat as we went past on an uphill, and we weren’t stopping now. Lucy was navigating as well as ever and we flew down a hill, past a control and James with his camera. We could see the event flags, but we had a little detour for one more high scoring control in a narrow tunnel under the road. By now we knew we’d be getting back early, but we kept running just in case time mattered. We came into the ‘back’ of transition and found it amusing to make sure we ran round under the big yellow arch to finish. Third unheard of thing – we were back 7.5 minutes early! We knew we had a good score, but weren’t sure if it was because the course was a bit easier than usual or whether we had done well. We didn’t feel as if we had been ‘smashing’ it. But what really mattered today was that we had definitely met the FUN criteria. 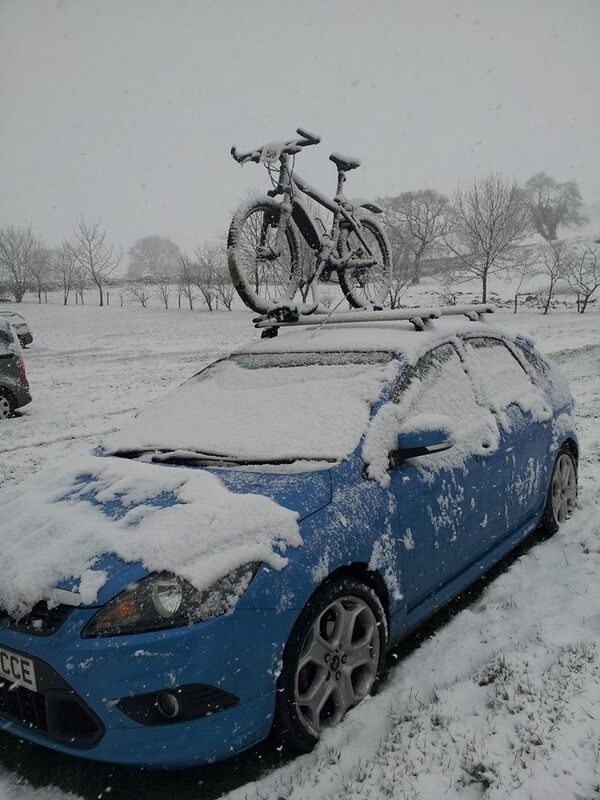 Our bikes and other transition kit was rapidly disappearing under the falling snow and it was a second race to get changed into dry warm kit before a chill set in. Our category was the first to be announced at prize giving, so we were on edge, not having a sense of how our score compared. But we ended up winning by a clear margin of 44 points, and finishing 11th overall. We’re usually over the moon if we make it into the top 10, so we are pretty pleased with this result! And the race back to the finish meant we beat the leading female solo – who had the same points as us but came in 13 seconds later 😀 . On reflection, our performance in this race far exceeded our expectations. I wonder whether moving at a consistent fair pace, combined with a commitment to stress free racing, helped us make better tactical choices. We might have been able to squeeze out 10 more points or so, but we made the right decisions for us at the times when we were faced with the options that would have got us those points. In any case, it all worked out. We will go into the last race as series leaders, but Sue and Louise are not far behind, so it will still be all to race for! Will we ever get out? As we tried to leave the race HQ the snow was falling hard. The steep little hill was too much for a van and we had to wait a while for them to be pushed out and for a tractor to clear the road. My friend Kim wasn’t sure of her snow driving abilities. We all lined up along the drive as if we were in a time trial. As we approached the line nerves were running a little high. The marshal waved us through as did the spectators along the verges! Luckily we made it to the top unscathed and had a very scenic drive home. 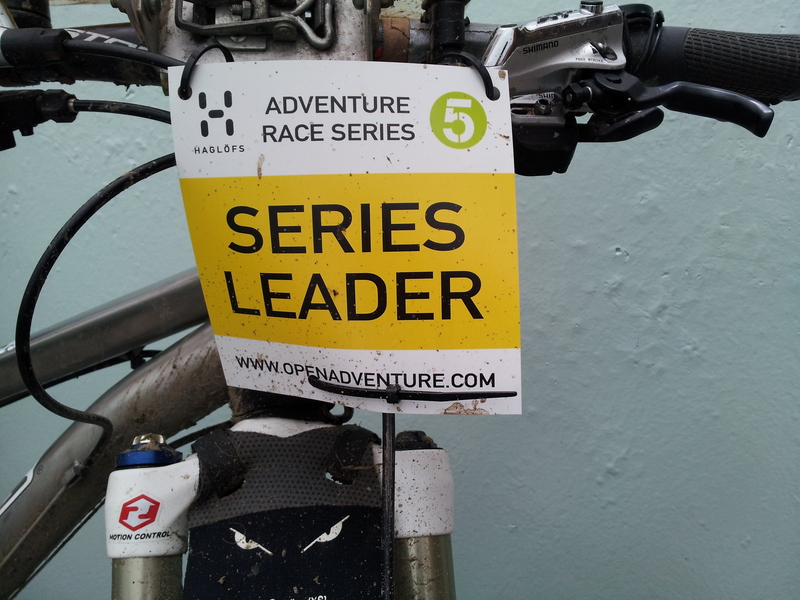 As usual, thanks to the organisers (Open Adventure), course planner (Chris Maudsley), volunteers, photographer (James Kirby) and series sponsor (Haglöfs). Also to my mum for having a perfect dinner on the table when I got in! 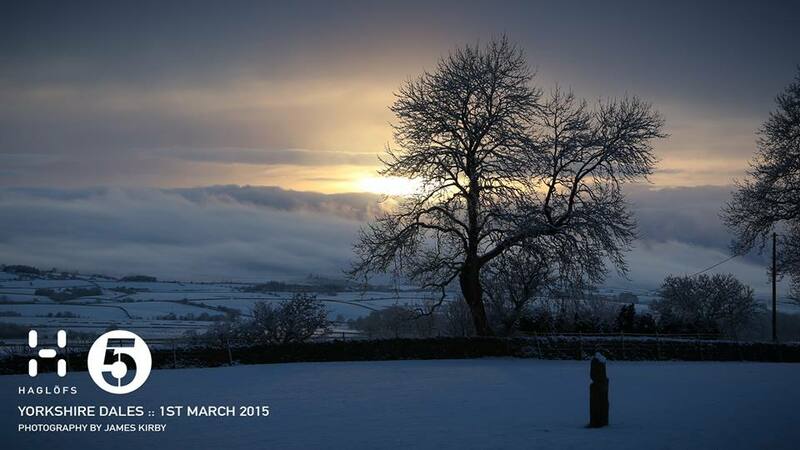 I’ve just come back from a fabulous weekend away in Yorkshire! This Open 5 had the advantage of being located quite close to my brother and his wife. My dad also fancied a visit, so I managed to combine racing with visiting family, eating out and being thoroughly looked after by my dad’s friends Jim and Penny. Thanks all! On to the race. My dad chucked me out of the car at 8:45 and set off back home. I wandered in to the hall to find Lucy so that we could register and start planning. Up until Wednesday I had been psyching myself up to race solo as she had been ill with the dreaded lurgy for 7 weeks! However, she made a last minute recovery and felt up to racing. Unfortunately, at 6pm on Thursday I was struck down too! Luckily by Sunday I felt a bit brighter. After my decent run at Bowhill I was excited to see how my legs would be. We set off and I was pleased to see that the normal springy running Lucy had returned after last month’s strange episode. I followed her round like a faithful dog and didn’t interfere ;-). Everything went pretty smoothly. With about 2km to go I hitched onto the tow. I was just keeping up but didn’t want to kill myself only to suffer on the bike. The effect was mostly motivational, plus the little reminder tug to keep up when my concentration lapsed :-). In just over 2 hours we came into transition and were soon biking. What a great course! Loads of riding, fast and dry and almost no pushing. 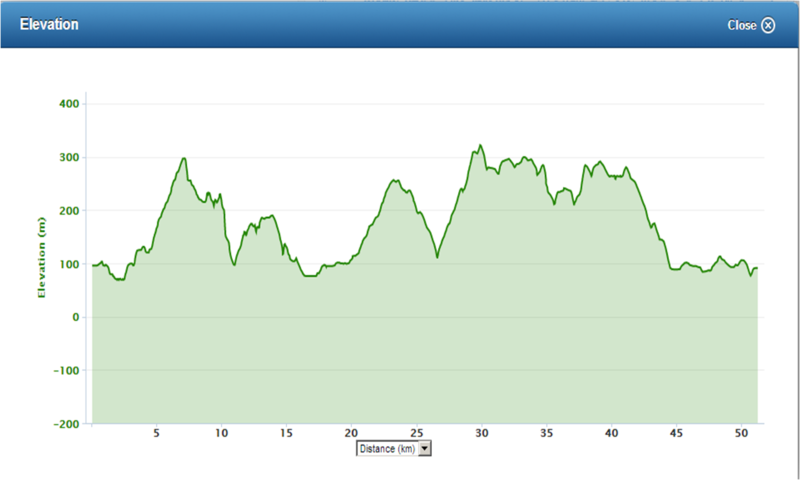 We knew we had two big hills near the start, but loved the downhill in between. On the long drag to the trig point my lungs were on fire, but we were soon there (well, after 30 minutes!) and admiring the panoramic views. That big hill in the middle took half an hour! Nothing would make us ride to Malham, hidden a long way down in a steep valley! Instead we whizzed around on top. After a few moments debate we did a long out and back to a control stuck in the middle of the map worth 20 points. For a while I thought it might be close for time, but we were soon hammering down a fast grassy, rocky track. We faced just 8km of almost our only road of the day back to the finish. It soon transpired we were going faster than I expected. There’s always a first for everything! This was even better than we had hoped. For a complicated reason relating to series scoring, any minutes early we could get in were a bonus. We finished in 4h45mins with 575 points. Enough to comfortably win our class. I am now the owner of a nice Haglöfs bag that I think Andy would steal, if only it wasn’t so PINK! After that, my only task was to cycle the 14km back to Skipton with all my kit to catch a train. I have to say, I was slowly falling apart and needed no persuading when, halfway there, a fellow racer pulled up in a car and offered me a lift. Many, many thanks Pete! This race was planned by Tom and Dawn. Dawn is going back home to America and we’ll miss her. 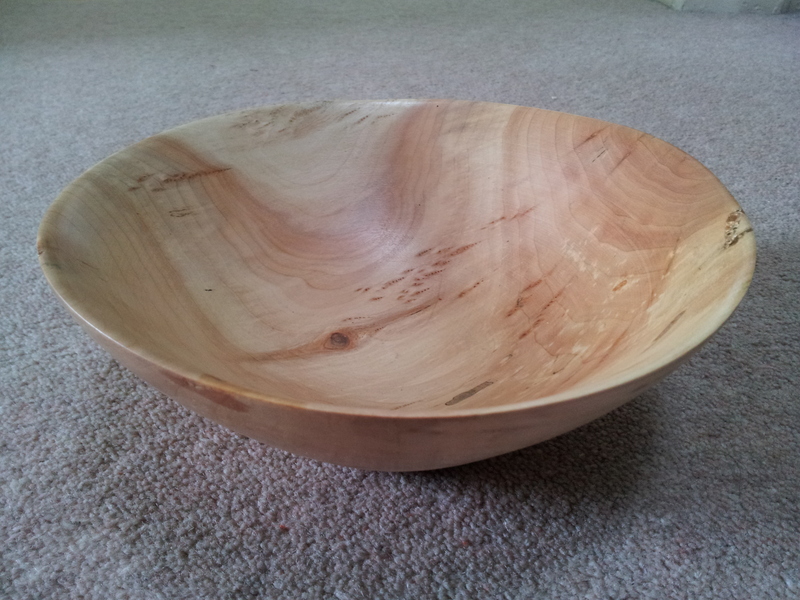 I was touched by the gift of a wooden bowl she had hand turned herself. Bye bye Dawn! Dawn made this bowl for me. I had hardly had time to get over the disappointments of the Sandman before it was time for the next race. I had entered the Polaris Challenge a week later! I spent the week feeling tired and wondering why on earth I had signed up for this. By the time I got to 15:30 on Thursday afternoon I didn’t think I would make it through Friday and asked my boss for an ‘emergency day off’ (to be deducted from annual leave, of course!). He agreed – and what a good decision it was. I relaxed on Thursday night, had a lie in on Friday, sorted out my packing without panicking and did a few chores before it was time to get the train. By then I was feeling much more positive and cheerful about the whole venture :-). I entered the race as a female pair with Lucy Harris. Lucy and I spent the winter sparring over the Open 5 series, so we knew we ought to be well matched! This was a bit of an experiment to test that out and to see how we got on working with each other instead of the usual head to head. By the time we had registered and got to Lucy’s friend’s very nearby house for the night, it was late. I wanted to examine maps, the others wanted to chat! 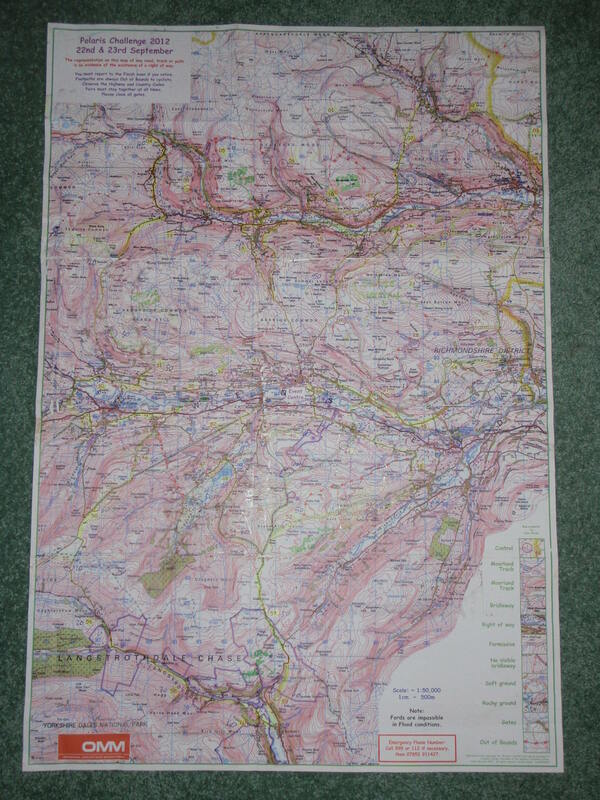 I looked at the map anyway, after they had gone to bed, and felt better for it :-). The difference between this and an Open 5 is the size of the thing. 4x A4! It was also very pink, which suggested many contours. 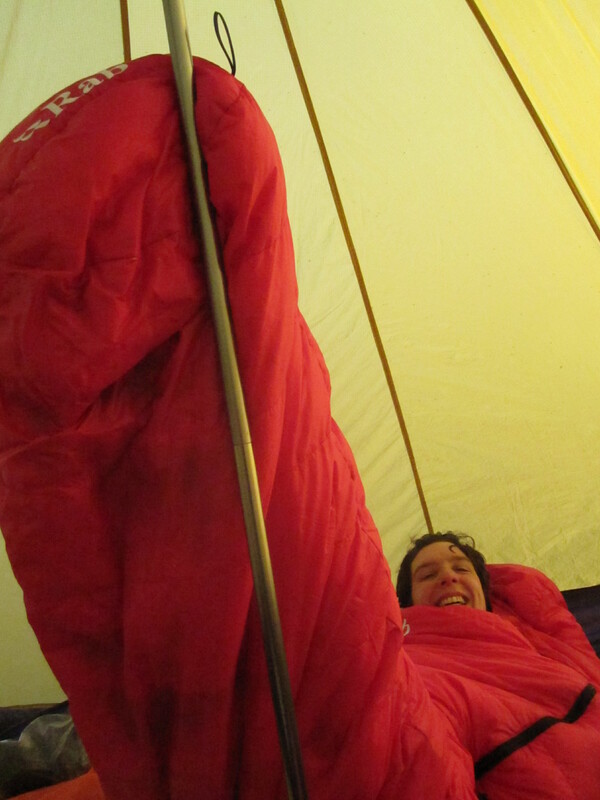 Me all cozy in sleeping bag in roomy tent! This event had the option of an overnight camp at a remote location, which we took. It brought back many memories for me of my first ever adventure racing event. Myself and Robert got hopelessly stuck on ‘indistinct paths’ in a place named ‘Hannel Bog’. On day 1 we lost all our points for lateness, didn’t have much food and squeezed into a tiny tent for the night. This time it was going to be different! For a start, I persuaded Lucy to let us take the really roomy tent at a 500g weight penalty, in exchange for leaving behind the big stove, my thermarest and some unnecessary extra food. The sun was shining; we set off in high spirits. As others passed us we carried on at our own pace, chatting away non-stop. I had a bad time between hours 4 and 5 but then got a new high, especially as we really started racing along about an hour from the end (7 hours in total). At the camp location we were surprised to find that we were up near the two leading mixed pairs on points, and just in front of Iwona, who well and truly beat me last year in the solo category. As the cold started to bite we dived into our toasty down sleeping bags well fed and happy. We chatted until ‘late’ – or so everyone commented the next day, but it was only about 10pm! Day 2 started cold and misty. The atmosphere seemed different from the previous day, perhaps also because we thought we should take it seriously now. 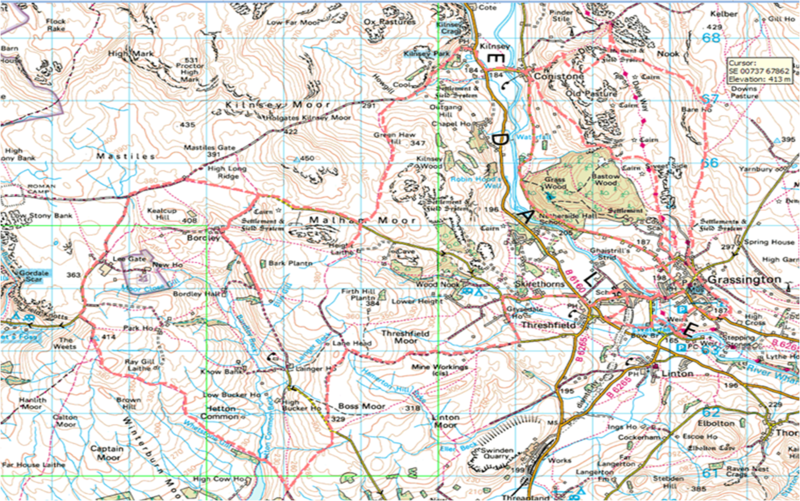 We got caught up with some people dithering over navigation and it was a distraction. Lucy was also not feeling as good as the day before. It turned out she had a bit of a cold coming on. But we got ourselves untangled and cleared our minds. 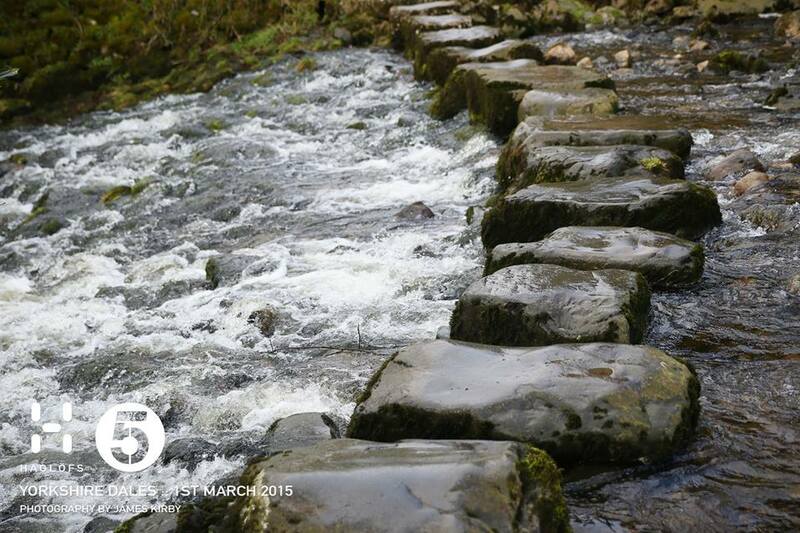 The stones were definitely NOT visible, and neither was the track clearly defined as it is in this shot! The second half of the 5-hour day went well, and we were moving at a good speed similar to the day before. After an agonising debate on a final control (would penalties wipe out all 60 points it was worth?) we sped to the finish. We thought it had all gone OK. But straight after download we realised something was awry. Our Saturday score was 11th best, but on Sunday we were only 26th and about 100 points down! This was a bit of a low point. However, on reflection our route choice wasn’t daft – we just didn’t have quite enough oomph on the day to pull it off properly at the end. There were also one or two smart tweaks that would have saved us energy or got more points for effort earlier on. These things can happen, but we were 17th overall and first female pair. More importantly, we did get on and we did have fun!